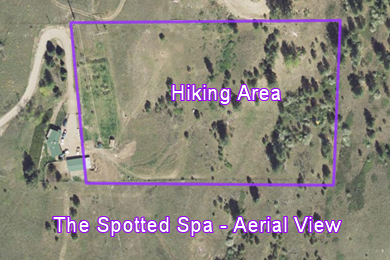 The Spotted Spa Retreat is located on 13 acres of country land behind the Kelowna Airport (Ellison area). Our guests have access to 4 of these acres for hiking which are fully fenced and consist of a combination of orchard, forest, fields and, of course, DogTown. This area is also complete with water buckets to keep our guests hydrated and baby pools for splashing around in the summer. We do require that all guests play well with others...all makes, models and years. We do have two “penalty pens” that we use if we have personality conflicts among guests. Our third pen is small dog proof for our pint-sized guests plus it also does double duty for our puppies and seniors not to mention our shier guests who might not be ready to enter into general population. Check out our new Google Virtual Tour! In order to facilitate so much room for our guests to run and play on we chose to be located out in the Ellison area of Kelowna, behind the Kelowna Airport. To compensate for this long drive for our clients we started the k9 shuttle service which transports our guests to us. We offer two options: Option 1 - is three stops at designated locations and times in the different areas of Kelowna Option 2 - offers door-to-door pick up and drop off. We have one vehicle that does all the stops and we try and work both options into each other to save on fuel and the time our guests spend in the vehicle. The shuttle is outfitted with crates so each guest has their own digs for the ride to and from the spa. This service can be used for both daycare and sleepover guests. With all the different protocols and theories regarding vaccinations The Spotted Spa Retreat has taken the approach that vaccinations are up to each human’s individual discretion. Keeping that in mind please be aware that we do have some guests that are not fully vaccinated, and there is the possibility that our guests may encounter some wildlife and who knows what they may have. This protocol also includes the use of flea, tick and lice preventative so if there are any concerns please Revolution or Advantage your pup before their arrival. At the Spotted Spa we are committed to taking care of all your fur-kids’ needs and this includes administering medication at no extra charge. We are comfortable giving insulin injections, administering medication directly in mouths (and yes we still have all our fingers) or if your pup has no allergies and a great appetite we are considering buying shares in “Pill Pockets” as we always have a large supply on hand. All we ask is for detailed instructions. Our policy is to always follow the vet recommended dosage written on medication bottles. So if the dose we are instructed to administer is different than the bottle please don’t be offended but we will be calling your vet to confirm the change is okay. This, again, is to maintain our high quality of care for your pup......as sometimes mistakes are made when writing instructions out. The only rule strongly enforced at The Spotted Spa Retreat is no fighting. We expect all guests to play well with others, not be keen on jumping our fences or digging underneath them. We also discourage excessive barking. Human Rules: Do not approach the fences or call your dog for any reason. When dropping off your dog please have them on a leash to enter the spa so they do not run up to the fence to meet the other dogs. When picking up your dog do not talk to them at the fence as we will have a very difficult time convincing them to come inside which is the only way they can get to you. Come into our reception area and we will bring your pet to you. When you get your dog home: It is best to wait at least 30 minutes after arriving home to offer food or water. It is normal for dogs to be thirsty when they get home. Many dogs get extremely excited about seeing their owners and pant heavily in their excitement. This causes loss of water vapor. DO NOT let them drink large quantities of water, quickly. This could upset their stomachs and cause vomiting and/or diarrhea. Loose stools can also be caused by a diet change or stress, and it is not abnormal for your pet to exhibit this after a boarding stay. It is not unusual for a dog to be tired for a few days after going home from the kennel. It is much like people that have been staying in motels; you just don't rest as well away from home. Chances are, also, that your dog has been very active or more active than normal during his stay with us. 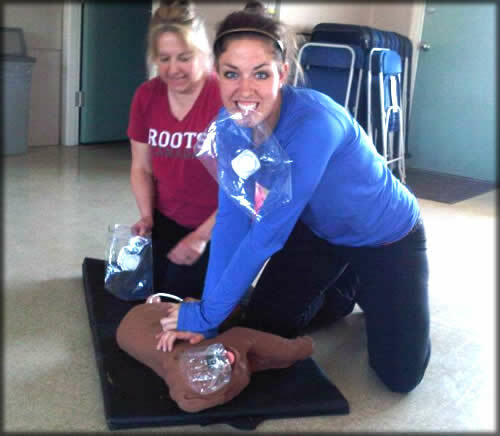 All Spotted Spa canine executive officers successfully completed the DogSafe Canine First Aid. We all have a passion for dogs and enjoy getting to know their unique personalities and watching their crazy antics. Please read about all of us individually below so that you can feel more comfortable leaving your fur kid with us for their stay. Hey there my name is Sheila, I own and operate The Spotted Spa Retreat. I opened my door in the fall of 2003 and have never regretted a minute of it since. Okay, honestly there has been the odd minute here and there...I can’t lie. I left college in Ontario with a diploma in Architectural Technology and started my career designing engineered floor systems for a structural engineering company in Langley. Shortly after moving to Kelowna I started working for a local veterinary clinic in the hopes of acquiring more hands on experience with dogs “at their worst” and also began construction of the first Spotted Spa. Then, after a one month trip to Europe, I opened the doors to my dream on September 20, 2003. When I first decided that I wanted to open a dog daycare and eventually expand to a kennel I wanted to incorporate my Dalmatian, Bacardi, in to the name of the business. So needless to say that is how I came up with The Spotted Spa Retreat. In my logo it is actually the side of Bacardi that was used to make the spot pattern. So even though he left me for the Rainbow Bridge in the Spring of 2007 he is always with us at the Spa. Hiking with dogs and running the business are how I spend the brunt of my days but I do love to stay busy so I am also involved in a few local organizations. So where and when will you find me? On any given day of the week I may be driving the K9 Shuttle, greeting guests, cleaning the spa, or tending to the never-ending yard or paperwork for the Spa. Outside of the Spa I am the secretary and hall administrator for the Ellison Community Hall (so if you’re planning a wedding I have the reception site for you! ), I am the scheduler for the Kelowna Women’s Soccer League, as well as am a player and assistant referee within the league. I also train three times per week for powerlifting competing at the provincial level and am a member of the Ellison Volunteer Fire Department. If you can’t find me doing any of the above and it’s the summer I am likely cruising around on my motorcycle or sitting in a boat out on the lake. Hi my name is Dani, I was born in Edmonton, Alberta and moved to Kelowna when I was very young and have been living here ever since. I am a undergraduate student at UBCO. Once I am finished school here, I am hoping to get into Veterinary School. Working at the Spotted Spa not only brings a smile to my face every time I work but helps me gain experience and work with animals as well. I have always had a passion for animals, especially dogs throughout my childhood. I have grown up with dogs in my house hold and I currently own one now. My dog is a Miniature American Eskimo, named "Kodah" and he is 2 years old and very special to me. I am very grateful to be given a job at the Spotted Spa and it is never a dull moment. There is never a time where I am not smiling at work, as these dogs bring joy and happiness to my day. I have a few hobbies, including ringette which I have been playing for 7 years. Ringette has been a passion for me and I enjoy the game very much. I am very athletic and love to play sports, go hiking or just any outdoor activities usually involving dogs. I also love spending time with my family and friends. The Spotted Spa is the best job I have ever had and it allows me to have a permanent smile on my face and makes any bad day better. I hope to see you and your furry friend at The Spotted Spa soon! Hello, my name is Meghan and I am so happy to have the opportunity to be an auntie at the Spotted Spa. I am originally from Toronto but have called Kelowna home for the last 25 years. Growing up my family and I had two cats, and both were members of the family rather than just pets. With the purchase of my first home I was able to welcome Peanut into my life, and it’s been a happy chaos ever since. During the last year I have also opened my home to fostering dogs with a local rescue organization, and it reawakened my passion and love for dogs of all shapes and sizes. It was through fostering that I came to meet and fall in love with Ruby, the newest addition to my family. I love coming to work and seeing the wagging tails and excited faces ready for a day of hiking and play. I look forward to getting to know all the fur-kids and pet-parents of the Spotted Spa! Hi I’m Maiya, I started volunteering at The Spotted Spa in the summer of 2016 and I am absolutely loving it ever since. All of my life I have had an extreme passion for dogs but had been unable to have one of my own due to my mom’s severe allergies to animals. Until one day a golden doodle puppy named Neeko ran his way into our hearts. He doesn’t shed at all so we fell more in love with him every day. I go to school at Rutland Senior Secondary and work at the spa on the weekends. I love working here because it gives me the opportunity to do something I truly enjoy. This also gives Neeko the chance to make some new friends and play his little heart out. During the week and on Saturdays I enjoy playing soccer. It helps to keep my legs strong for all the hiking we do at the spa! In the winter my family and I head up to big white and ski, I’ve been skiing all my life and when we rent a condo up there every year it makes it that much better. I love every happy dog that walks through the door and they always make my day! I absolutely love it her at the spa and I am hoping to be there for a while! Born in England and raised in Port Coquitlam, I moved to the Okanagan in 1993 and specifically Kelowna in 1995 and that is where dogs took on a whole new meaning in my life. In 1995 I got a little spitfire Border Collie / German Shepherd / who knows what mix? (Shaydar) that took my life in a new direction. He was a ton of energy and a ton of work but I would not trade the people I met or the things I did along the way. We started doing obedience together because he needed to work A LOT. Then came dog #2 (McCoy) which with an SPCA Special that looked like a German Shepherd that also needed a lot of obedience, which led to tracking to Schutzhund training and even Flyball, somewhere along the way agility happened and that is my love now. Dog #3 (Gili) a little rescue kelpie x with a bright future in agility led me to the Original “Spotted Spa Retreat” and Sheila. Those dogs have all since passed on and can be seen on the Spotted Spa’s Rainbow Bridge page and I have a new 3 that I live with. “Brisz”, my first purebred dog is a registered Australian Kelpie that up until this year was my main man and my competition agility dog, he has now retired after having ACL surgery this summer. 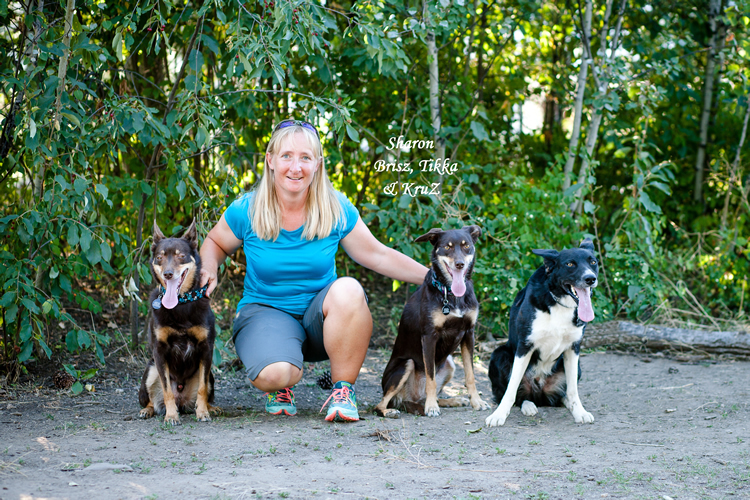 Because one Kelpie is never enough ;-) I got “Tikka” who is my seminar and practice agility dog (she gets too nervous at trials) and the dog that has taught me the most about never giving up and patience. She is now my competition Sheep Herding dog and has done quite well in the winter arena trials held locally. Last is my true love…a dog I had not wanted nor planned but one that was truly meant to be. “ KruZ” as I call him is a registered Border Collie from a local breeder in town. All I can say about him is he is “PERFECT”. He never leaves my side and can read my thoughts and at just 1 yr old, we have so much to look forward to together. The possibilities are endless with KruZ. I have taught agility for the past 12 yrs and participated in clinics and seminars for everything related to dogs.. Aggression, Agility, Behaviour, Clicker, Flyball, Obedience, Rally Obedience, Scent Hurdling, Sheep Herding and Tricks and I if I haven’t been involved in it, I know someone who has. I spend my weekdays at my full time job and I am looking forward to spending my weekends at the Spotted Spa making sure your 4 legged family member has a great time away from home. Hi! My name is Tia. I have loved all animals, dogs especially for as long as I can remember. After begging and pleading for years, I finally got my first puppy when I was 7, and have had them ever since. Right now, I have two dogs. “Indi” is our 80 pound lapdog, a Rottweiler cross. "Bleu", a beautiful bouncy golden retriever, is unlike any other dog I’ve known, who makes the highlight of every day walking in the front door. I love all dogs of any kind so of course when the opportunity to work at a dog spa came up I was all over it. I’ve worked at the Spotted Spa on the school breaks (summer, Christmas, spring etc…) for over a year now and was volunteering before that as much as I could. The Spotted Spa is a very special place for me and I love it there almost as much as the dogs do I think. Hope to see you and your furry friends there soon!